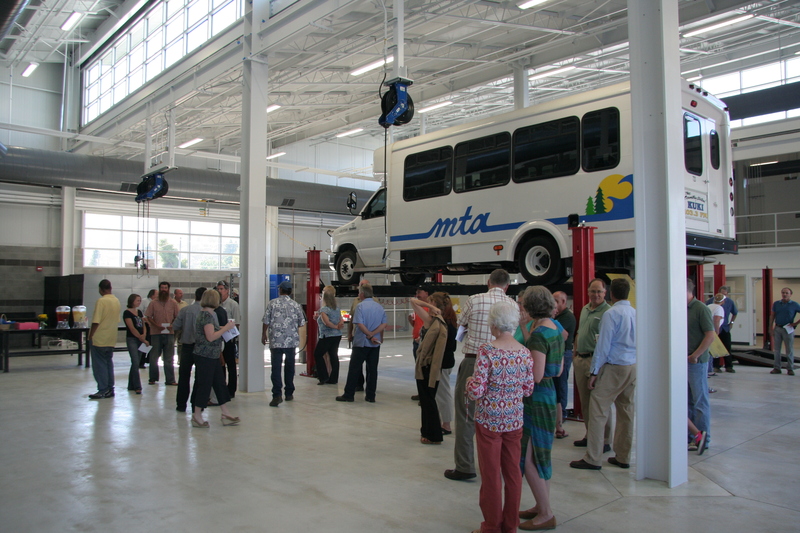 The Mendocino Transit Authority’s (MTA) new bus maintenance facility in Ukiah was dedicated last night. Representatives of MTA, TLCD Architecture, GHD, Arntz Builders, and members of the community attended the dedication, which included dinner for the guests. Jeff Blechel, TLCD Architecture’s Designer and Project Architect led a tour of the impressive new facility. 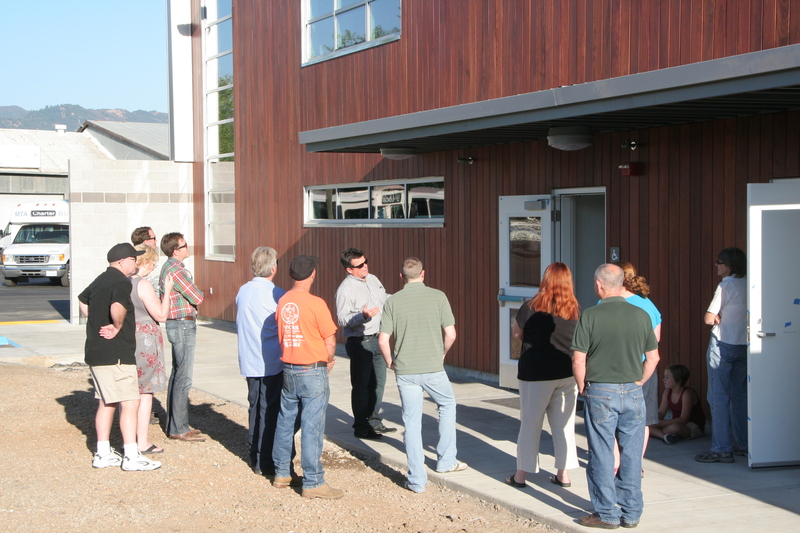 This project serves as the core maintenance facility for Mendocino County’s bus fleet. In addition to maintenance bays the project includes shops, storage, fueling, and vehicle wash facilities. The project was designed to minimize operational and maintenance costs, and to provide a strong visual presence from the adjacent freeway. A dramatic, “sawtooth” roof defines the facility. This configuration allows for north facing clerestory windows that maximizes daylight harvesting while providing the ideal orientation for rooftop photovoltaic panels. Prefinished insulated metal panels are attached directly to the metal structure, a simple and cost-effective alternative to a traditional stud wall. These panels do not require painting or maintenance and are one of many sustainable features of this project. The metal panels sit on a base of patterned concrete block walls that provide protection from vehicles. The north wall is constructed of hardwood “rainscreen” that references the local timber industry and nearby lumber mill. Jeff had way too much fun on working on this project – now I can see why! What a fabulous building. I don’t normally associate “bus maintenance” with awesome architecture, but this looks like a really neat project. Very open and light!